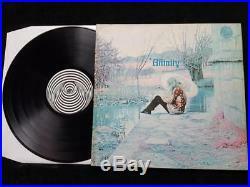 Affinity’Linda Hoyle’ LP UK 1st Pressing Large Vertigo Swirl 6360-004 1970 EX+. Mirror like glossy black vinyl.. A couple of light wisps only under bright light. Cover suffers from some storage edge wear (see photo) Overwise very sharp and crisp. M INT- THE RECORD ITSELF IS IN BRAND NEW CONDITION WITH NO SURFACE MARKS OR DETERIORATION IN SOUND QUALITY. RECORDS STATED AS UNPLAYED OR SEALED ARE MINT. EX CELLENT – THE RECORD SHOWS SOME SIGNS OF HAVING BEEN PLAYED, BUT THERE IS VERY LITTLE LESSENING IN SOUND QUALITY. G OOD – THE RECORD HAS OBVIOUSLY BEEN PLAYED MANY TIMES, BUT DISPLAYS NO MAJOR DETORIORATION IN SOUND QUALITY, DESPITE NOTICEABLE SURFACE MARKS AND THE OCCASIONAL LIGHT SCRATCH. G OOD – THE RECORD HAS BEEN PLAYED SO MUCH THAT THE SOUND QUALITY HAS NOTICEABLY DETERIORATED, PERHAPS WITH SOME DISTORTION AND MILD SCRATCHES. F AIR – THE RECORD IS STILL JUST PLAYABLE BUT HAS NOT BEEN CARED FOR PROPERLY AND DISPLAYS CONSIDERABLE SURFACE NOICE; IT MAY EVEN JUMP. P OOR – THE RECORD WILL NOT PLAY PROPERLY DUE TO SCRATCHES, BAD SURFACE NOISE, ETC. B AD – THE RECORD IS UNPLAYABLE OR MIGHT EVEN BE BROKEN. IS ONLY OF USE AS A COLLECTION FILLER. M INT – THE COVER AND ANY EXTRA ITEMS SUCH AS THE LYRIC SHEET, BOOKLET OR POSTER ARE IN PERFECT CONDITION. EX CELLENT – THE COVER AND PACKAGING MIGHT HAVE SLIGHT WEAR AND / OR CREASING. G OOD – NORMAL WEAR AND TEAR ON THE COVER OR EXTRA ITEMS, WITHOUT ANY MAJOR DEFECTS. G OOD – THE COVER AND CONTENTS SUFFER FROM FOLDING, SCUFFING, SPINE SPLITS, DISCOLORATION, ETC. F AIR – THE COVER AND CONTENTS WILL BE TORN, STAINED AND/ OR DEFACED. P OOR – THE COVER AND CONTENTS WILL BE BADLY DAMAGED OR PARTLY MISSING. Note: Cover is Graded First. Extra, please ask for cost. Please ask for details or cost if you are unsure about this service. Sometimes same day dispatch. Thanks for your continued custom. I know what it is to play grade and judge a quality listening experience. I try extremely hard to grade as strictly as possible with each record listed. All records are cleaned thoroughly on A VPI 16.5 Cleaning Machine prior to play grading, then housed in a new anti static poly sleeve. I usually answer within 24 hours. Get Supersized Images & Free Image Hosting. Tailor your auctions with Auctiva’s. Track Page Views With. Auctiva’s FREE Counter. The item “Affinity’Linda Hoyle’ LP UK 1st Pressing Large Vertigo Swirl 6360-004 1970 EX+” is in sale since Saturday, September 15, 2018. This item is in the category “Music\Records”. The seller is “wilsons-music” and is located in Wallasey. This item can be shipped worldwide.